‘Tis the season for pumpkin spice lattes. Even if you’re not a fan of the fall beverage, we’ve all been touched by the 15-year dominance of Starbucks’ signature PSL (that’s pumpkin spice latte in coffee lingo) and its pumpkin spice spawn. You might be tempted to pin success of the fall flavoring on Starbucks. But as it turns out, pumpkin spice was bound to be a hit, whether the coffee chain popularized it or not. That familiar taste of cardamom and clove was something our ancient ancestors were fond of, too. So what is it about pumpkin spice that made it a blockbuster, not just today, but centuries ago? And how do spice makers predict if something is going to be a hit or a bust? Senior flavorist Terry Miesle and food scientist Kantha Shelke join guest host Flora Lichtman to talk about spice trends old and new. 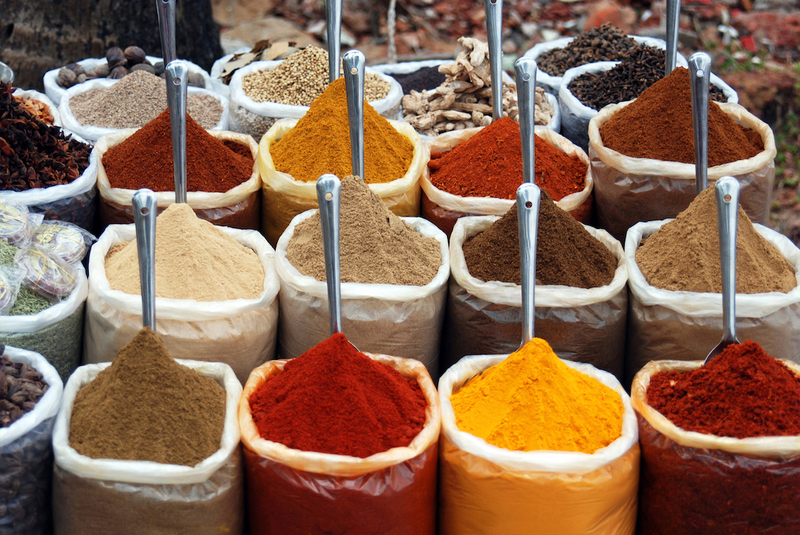 Curious about this past year’s spice trends? Check out McCormick’s 2018 flavor forecast. Learn more about the six flavor trends shaping the food industry. Dive into some fun food facts about pumpkin spice. Check out this very meaty (pun intended) resource on the latest food trends and insights. Kantha Shelke is a food scientist and the Founder and Principal of Corvus Blue, LLC in Chicago, Illinois. Terry Miesle is a Senior Flavorist at FONA International in Geneva, Illinois. FLORA LICHTMAN: This is Science Friday. I’m Flora Lichtman. So coming into this week I had a question, is anyone working on the next pumpkin spice? It has been 15 years since Starbucks launched the pumpkin spice latte. I know, 15 years. And if you are like me, maybe you are feeling some PSF– Pumpkin Spice Fatigue. But as it turns out, we might not be able to blame Starbucks alone. The pumpkin spice latte was bound to be a hit whether the coffee chain popularized it or not. That familiar taste of cardamom and clove. People around the globe have been into these flavors for centuries. So what is it about pumpkin spice that makes it a blockbuster not just today but centuries ago? And how do spice makers predict if something is going to be a hit or a bust? And who decides what next year’s trendy spice is going to be? To answer all of these spicy questions and more we have to ask the tastemakers. Terry Miesle is a Senior Flavorist with FONA International in Geneva, Illinois. Welcome to Science Friday. FLORA LICHTMAN: Kantha Shelke is a food scientist and founder of Corvus Blue LLC and a member of the Institute for Food Technologists in Chicago, Illinois. Welcome to Science Friday. KANTHA SHELKE: Thank you, Flora. FLORA LICHTMAN: And a question to our listeners, do you have a question about your spice cabinet? I know you do. Give us a call. 844-724-8255. That’s 844-SCI-TALK or tweet us @scifri. OK. Kantha, let’s start with you. Why is pumpkin spice such a hit? KANTHA SHELKE: Nothing says fall and celebrations like pumpkin spice. It’s just the mixture of, as you said, cardamom, cinnamon, cloves ginger, nutmeg that no matter where you are in the world it means celebration. It means festivities. In the east, it’s a little more savory. So whether you are in Iran and having some kind of a ghormeh sabzi or in a northern part of India and having a Mughlai cuisine and having a rich meat dish, it’s the same set of spices that Starbucks so cleverly took to make the sweet pumpkin spice latte that everybody craves at this time of the year. FLORA LICHTMAN: Terry, how do people in the flavor world think about pumpkin spice. Like, is it passe? Is it revered as a pinnacle of invention in spiceology? TERRY MIESLE: At this point pumpkin pie spice is pretty much a universal. There’s a lot of good reasons for that. I can talk a little bit technically about it if you’d like. FLORA LICHTMAN: Maybe not technically, but I would love to hear why. TERRY MIESLE: Right. Well these are old spices that we’ve been using them for thousands of years. And at harvest time– that’s cooking. That’s when we’re cooking the pumpkins, cooking the apples. And clove is really the key here. It’s like the center of the plates where it’s reinforcing the flavors of the apples, reinforcing the flavors of the pumpkins, and almost everything else you cook it with have the same compounds that clove does. So if you think about flavor theory for a minute where you have food pairings where you’re like and like versus, say, mint and orange, which don’t work, clove works with all of these things because it reinforces the flavors that are there. And then the other stuff like your cardamom, like your cinnamon and nutmeg, kind of sit on top. And they add a little bit of extra bit. The other thing that works in the wintertime is that these are warming spices. They actually affect the trigeminal nerves just like mint does feel cool and capsicum feels hot. These have a warming, mild but very long lingering spice. So when you drink it, it feels good for a really long time. FLORA LICHTMAN: That’s a perfect pairing for the cold weather. FLORA LICHTMAN: Kantha, when we’re talking about pumpkin spice lattes, you know we know that it taste like nutmeg and cardamom and ginger cinnamon. But is it made up? Is that spice mix made up of spices in my cabinet? KANTHA SHELKE: Not really. So while all the spices that Terry mentioned are definitely there represented in pumpkin spice, what Starbucks did that was so clever was not put pumpkin pie spice but the combination of aromas and tastes and flavors of an actual pumpkin pie baking. So if you went to a kitchen cabinet and took the spices and put them into your drink, what you would get is like a traditional Indian Chai or a masala tea. But what Starbucks has– which is pumpkin spice today and what everybody loves– is the actual feeling of as if you are near a pumpkin pie being baked with the sugar and the butter, et cetera. But without all those calories. FLORA LICHTMAN: So you’re replacing the flavors of the pie– the baked pumpkin, not so much the spices themselves. FLORA LICHTMAN: Terry, if a customer were to come to you– like a Starbucks or another big company– and say, Terry, we want the next pumpkin spice to put in our coffee drink or whatever. How– where would you start? How would you go about creating that? TERRY MIESLE: Right. Well we work with our marketers. We work with people who kind of scour the market and see what’s going on around the world. For coffee, especially, I would look at other traditions. Middle Eastern traditions. Scandinavian traditions. That sort of thing. See what we can introduce that way. And when you think of those, they’re used with deserts in Middle Eastern. You’re serving it with nuts and such. Maybe we can bring some of those components together. Maybe in Scandinavia, you’ve got your baked goods and your cookies. Maybe we can bring some of those flavors together with the coffee and provide something that’s in the same family as the pumpkin pie spice latte, but it’s different. FLORA LICHTMAN: Is there a next pumpkin spice? I mean, what is coming down the pike? TERRY MIESLE: That’s– a lot of people are working on that. And that’s– it’s going to be a tough one to match– to top that’s for sure. FLORA LICHTMAN: Is this a trade secret or something? What, what– give me some examples. TERRY MIESLE: The– well, like I said, those are the– it’s going to be tough to do that. I would look toward the baking industries as far as that goes, try to bring some cookie profiles into the coffee. Things that you would be dunking into your coffee already. That’s the sort of thing I would start looking into. FLORA LICHTMAN: What about Kantha? What about you? KANTHA SHELKE: Actually, I think we already have it. FLORA LICHTMAN: What is it? KANTHA SHELKE: See? I can hear it in your voice. So when you mention chocolate, when you mentioned the brownie baking, the very thought conjures up this celebration and the richness, et cetera. And people have been trying to replicate that in beverages. So coffee, coffee with brownie flavor, coffee with chocolate aroma and flavors is very, very big. So people have been trying that for a very long time. When somebody hits it, let me tell you. Watch out, pumpkin spice. FLORA LICHTMAN: Terry, I know that companies like McCormick put out these flavor forecasts every year. Do you know what’s– what are the trends I should be looking out for in 2019? TERRY MIESLE: I think we’re going to see a lot more of, say, exotic comfort foods. Your old standards with a new twist to it. Think of stuff that’s hit already like Sriracha donuts and the Asian barbecues. FLORA LICHTMAN: So exotic to us. Comfort foods in the West. TERRY MIESLE: Right. It’s the same food, but now you’re pairing it– you’re turning it into something a little bit more exotic. FLORA LICHTMAN: Sriracha donuts? I don’t know. They’re– oh, that’s great. That’s terrific. KANTHA SHELKE: Have you tried Sriracha ice cream and Sriracha in chocolate? It’s wonderful. And it only brings out the subtle flavors of chocolate, et cetera but gives it a little bit of a peak that especially millennials love. So Terry is spot on. FLORA LICHTMAN: Kantha, I feel like Sriracha ice cream is a flavor only a flavor scientists could love. KANTHA SHELKE: That’s true. Very true. TERRY MIESLE: It may be a flavor only younger people love, but those things have a tendency to spread and to bring something new. FLORA LICHTMAN: In our research for this segment, we came across a flavor called kokumi. FLORA LICHTMAN: You both know it. FLORA LICHTMAN: I love how you’re responding with enthusiasm. I had never heard it before. Kantha, what is kokumi? KANTHA SHELKE: Kokumi is that feeling where you look into a bowl of soup. And you look for the chicken inside it, and all you have is a liquid soup. A clear broth. And you’re going, where is the chicken? That’s kokumi. It’s deliciousness. It’s that meatiness that you can only get from kokumi. FLORA LICHTMAN: Is it like umami? KANTHA SHELKE: It’s related to. Yes. FLORA LICHTMAN: Would you add anything there, Terry? TERRY MIESLE: Yeah, it is related to umami. Umami is essentially our bodies sensing protein. And we crave the protein, so we have this reaction to it. Kokumi is a little bit more than that. It’s more like tasting the whole proteins in the whole– the nice juiciness, everything that’s released as you cook foods. KANTHA SHELKE: I think the best way to describe it would be deliciousness. TERRY MIESLE: Literally I think that’s what it means, right? FLORA LICHTMAN: And it’s in– chicken soup is where I could find it? Anywhere else? KANTHA SHELKE: You could probably find it in chicken soup. You can find it in tomato paste. You can find it in mushroom soup. Things like that that people like. But when it is made properly and made with artistic creativity, people actually look at you and go, you’re kidding? This is just liquid? Where is the mushroom? Where’s the chicken? You just look into it because it is so delicious. FLORA LICHTMAN: Let’s go to the phone. We have lots of questions. Let’s go to Zachary in Charlotte, North Carolina. Welcome to Science Friday, Zachary. FLORA LICHTMAN: What’s your question? ZACHARY: I want to know– I want to know what makes root beer taste like root beer? And where can I get some? KANTHA SHELKE: Terry, that’s your question. ZACHARY: Also, Sriracha donuts for the win. TERRY MIESLE: Sriracha donuts for the win. And apple cider donuts, right? Root beer is interesting. It started out as brewed from the roots of birch trees. And those have compounds that are related to or sometimes the same as wintergreen. So if you take your wintergreen lifesaver, it will taste very much like root beer. You add some vanilla in there with it, and now you’ve got a good beverage. FLORA LICHTMAN: Wintergreen is the heart of root beer? TERRY MIESLE: It’s the same compound. FLORA LICHTMAN: I’m really surprised. TERRY MIESLE: Yeah. Taste them. FLORA LICHTMAN: I’m going to have to– next time I have root beer I’m going to think about that. Let’s go to the phones. Let’s go to Mary in Sutter Creek, California. MARY: Hi. Yes, Hello. Cilantro, which most people love, tastes like soap to me. And I know there are a few others who have this sort of– cilantro. I don’t know why but– and I think it’s related to coriander. Hello? FLORA LICHTMAN: Yeah, what is the deal with that– with cilantro tasting like soap? KANTHA SHELKE: I think it has to do with the fact that cilantro is coriander. And in some cultures, the types of soaps and the aromas that were used with soaps had something very close to coriander. And so for those who are not used to it, it has a soapy taste. But to people in the East or even if you’re in Mexico, you cannot have a salsa without cilantro. TERRY MIESLE: Cilantro is very polarizing. So you either– people either like it or they don’t. And a lot of that is how you grew up. If you grew up eating it, you tend to like it. They rely on similar compounds that we put in soaps to make them smell fresh. These are naturally occurring in cilantro. So you are smelling the same thing. TERRY MIESLE: The same family of compounds. FLORA LICHTMAN: I’m Flora Lichtman. And this is Science Friday from WNYC Studios. Kantha, how do spice trends spread? Like, do they go from one part of the globe to the other typically? KANTHA SHELKE: Well, today with the disintermediation of the internet it just catches ablaze instantly. So there might be someone very young out in the Philippines who comes up with something. And the next thing you know there’s someone out in Ghana. And then there are kids and millennials out in Carson City or in North Dakota that pick up on it because they’ve got something else that connects them. And that which connects them also connects them on this spice and or flavor front. So that’s how you see all these various spices like flaming Cheetos. When it came out, it was because somebody said you’ve got to try it. And that’s a dare that young people cannot pass by. FLORA LICHTMAN: It’s like a flavor meme, the flaming Cheeto. KANTHA SHELKE: You’re absolutely right. FLORA LICHTMAN: I wonder– are there spices in our kitchen cabinet that aren’t actually spices at all? Like, I feel like I’ve heard about liquid smoke. What’s going on with that? Terry? Or Kantha? KANTHA SHELKE: Liquid smoke is just a distillate of the aromas, et cetera, that you’d find in something that is smoky. Terry, take it from here. TERRY MIESLE: Right. Liquid smoke is literally smoke captured via condensation. So you burn it. You capture it in a still in a medium– in water. And you preserve it. FLORA LICHTMAN: It’s actual smoke? TERRY MIESLE: So, it is actual smoke. TERRY MIESLE: And so if you were to scrape the sides of a smokehouse or swab the sides of a smokehouse after you’ve been using it, those are the same compounds. That’s the same thing. FLORA LICHTMAN: We got a tweet from Amanda. Are new spices being discovered or are food scientists just trying out new combinations? KANTHA SHELKE: We’ve discovered every spice that there is today. And we discovered them more than 2,000 years ago. FLORA LICHTMAN: That’s a bold claim, Kantha. KANTHA SHELKE: No, no, no. It is. Nothing– we’ve got nothing new in the market there. But what we are doing and what food scientists are doing now is bringing them to prepared foods. So if you were out, you know, 50, 60 years ago and you were looking for prepared packaged foods, all you got was salt and pepper and maybe one or two spices. Today, walk into a supermarket and you can see jalapeno flavored, habanero flavored, Sriracha flavored. That, folks, is brought to you by the marvel of food science. TERRY MIESLE: So these spices have to be put into a form that can be used and into a product so they can be delivered. And that’s the big difference here. Where it was just at specialty markets and an Indian market or a Korean market or something. And now it’s available to everybody. FLORA LICHTMAN: Well, speaking of the marvel of food science, are there holy grail flavors? Like, flavors that exist in nature that cannot be reproduced. TERRY MIESLE: There are very fragile flavors. Things that are good fresh but don’t hold up to any processing. TERRY MIESLE: You can think about– fruits, in general, are very difficult. And they need some flavor help most of the time. So if you think of a fruit juice, it has to be pasteurized. It has to be brought to a market in a stable form. But often you lose a little bit. So that’s where we help out bringing some of those components back. Also things that just don’t last long. KANTHA SHELKE: And then there’s this flavor of mom’s cooking or grandma’s cooking. You hear about it. And everybody talks about it. And they go, well, it’s not just like what my mom used to make. So that we still have not been able to replicate. FLORA LICHTMAN: You can’t scrape that down and put it into a bottle. KANTHA SHELKE: Everyone’s tried. Not yet. FLORA LICHTMAN: This is so fascinating. Unfortunately, we’ve run out of time. But I’d like to thank my guests. Terry Miesle is a Senior Flavorist with FONA international in Geneva, Illinois. And Kantha Shelke is a food scientists and the founder of Corvus Blue LLC in Chicago. Thank you to you both. TERRY MIESLE: Thank you so much. KANTHA SHELKE: Thank you, Flora. It was a pleasure. Why Don’t Banana Candies Taste Like Real Bananas? Actually, they do. The story of artificial banana flavoring is, well, bananas.